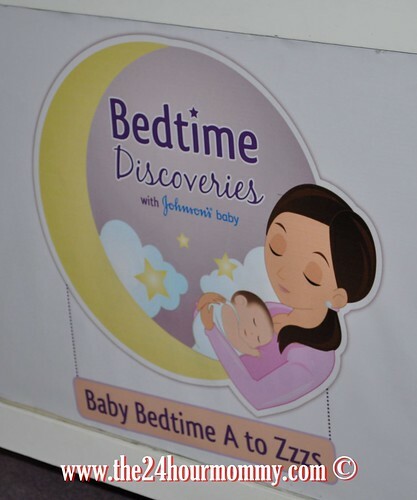 Last November 21, 2009, I attended the Johnson and Johnson Bedtime Discoveries event held in the Manila Peninsula. The event was hosted by Christine Bersola-Babao. 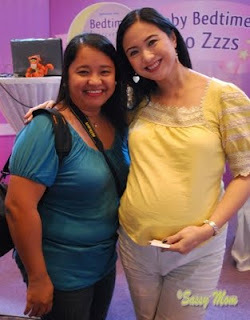 That day, I and the other mommy bloggers and mommies-to-be, were taught on the importance of sleep for children especially infants. We learned vital information from pediatric pulmonologist and sleep expert Dr. Luis Rivera of Asian Hospital and Makati Medical Center. Babies can have a light but lengthy sleep lasting 20 minutes or more. A shorter sleep cycle, lasting 50 to 60 minutes, is the most vulnerable period of night waking. Babies don't sleep as adults do. They have twice as much active, or light, sleep as adults. Hypnagogic State - "pre-sleep stage marked by visual, auditory, and kinesthetic sensations. Non-REM Sleep - consisting of four stages. REM Sleep - rapid eye movements, high frequency brain waves, paralysis of large muscles, and dreaming. REM Sleep - consolidation of new movements; role in learning; absent in lower mammals. Non-REM Sleep - people deprived of all sleep show greater time spent in non-REM sleep the next night. Growth - During sleep, 3x more growth hormones are released than when babies are awake. There are more opportunities for growth during baby's first few months of life than at any other stage in life. This is because they experience longer times in deep sleep (where growth happens). Most babies are able to sleep for most of the night but may wake up again in the middle of the night. The babies that have developed good sleep associations are able to go right back to sleep while the ones with the wrong associations cry out. A transitional object (a stuffed toy or blanket) should be incorporated into the bedtime routine. Condition the child to fall asleep on his own by putting him in bed while still drowsy, but awake. Most children will show improvement in a few days and will be sleeping through the night in a week or two. Use the Progressive Approach (Ferber Method) in which the child is left to cry for gradually long periods of time before returning to him briefly. Sleep is important for baby's optimal functioning. Sleep affects every aspect of a child's development. Sleep problems in children are common and can be chronic. Common sleep problems in babies include Day/Night Reversal, irregular sleep patterns, sleep regulation, and night-time wakings. These can continue as they grow older. They are treatable and preventable if managed appropriately. Sleep problems in children can have a major impact on the family. Mothers who are sleep-deprived can have post-partum depression. A 3-week study done in the US led by psychologist and pediatric sleep expert, Jodi Mindell. Clinical evaluation of baby's sleep with the use of a before bed routine and the Johnson's Baby Bedtime Range. Make sufficient sleep a family priority. Learn to recognize sleep problems. Talk to your baby's doctor about sleep. Step One: Give your baby a warm bath or punas. The bath will signal your baby that she is on her way to bed. Use warm water, coupled with gentle lathering touch to soothe baby. The soothing steady motion of the massage helps baby relax even more. Step Three: Some quite time. Spend some quiet, light,activities with your baby. This will drift her off to sleep. Most moms put powder after diaper change to keep baby comfortable during the night. Apply the powder on your hands first before spreading it to your baby's skin to prevent possible inhalation. I definitely learned a lot from this event. I had a good time with my fellow mommy bloggers, too. Thanks to Johnson and Johnson and Nuffnang Philippines for making this happen. The Johnson and Johnson marketing people guarantee that this is only the first of what's to come for mommies and babies so stay tuned! Salamat sa pag post. madaming matutulungan na parents ang post mo na ito hehe. hope to read more from you.